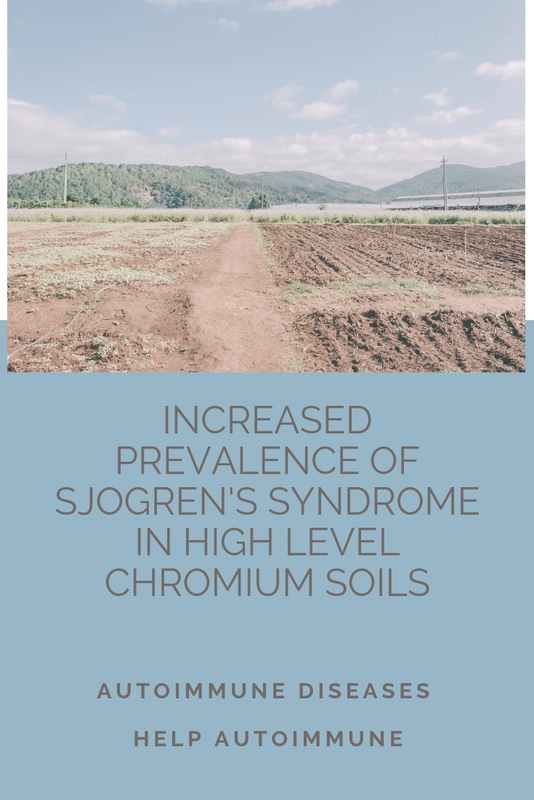 Three areas of Taiwan, Changhua, Taichung, and Nantou, were found to have the highest prevalence of Sjogren’s syndrome and the highest levels of chromium in the soil. Chromium is a naturally occurring heavy metal often used in industrial processes. It is known to cause health problems in humans. The main cause of chromium in high levels in the soil is from industrial sources. The following report is from ScienceDirect: Increased prevalence of Sjogren's syndrome in where soils contain high levels of chromium. The highest SS prevalence (53 per 105) was located in an area where farm soils contain the highest amounts of chromium. The SS prevalence is significantly increased in areas with high soil levels of chromium. Previously, we showed that farm soil levels of chromium were strongly correlated with people's serum chromium levels and an increase (3.6 fold) in both the incidence and prevalence of sicca syndrome in areas where farm soil chromium was high. Because Sjogren's syndrome (SS) is the major disease causing a dry mouth and dry eyes, we aimed in the study to investigate whether these areas with high soil chromium have a high SS prevalence. We used a database from the authority in charge of catastrophic illness certificates. Heavy metal concentrations in farm soils were retrieved from nationwide surveys. We used spatial regression models to study the relationships between the SS prevalence and soil metal concentrations. There were 11,220 people, 1165 men and 10,055 women who received a SS certificate from 2000 to 2011. The SS prevalence was 31 per 105 people, 5.59 for men and 55.01 for women. The highest SS prevalence in Taiwan was located in an area where farm soils contain the highest amounts of chromium. In contrast, other types of heavy metal did not show such a strong association. In conclusion, the SS prevalence is significantly increased in areas where soils contain high levels of chromium. Chromium is likely a risk for SS.